You&apos;re never far from tranquil, nature-hugging walking trails in Richmond – so long as you know where to go. With more than 80 kilometres (50 miles) of easy-access routes, options range from popular parks to sunset-spotting shoreline strolls and from protected wetland areas to scenic green spaces teeming with local and visiting birdlife. Pack your soft hiking shoes and check out some of our favourite trails below. Click here for additional trail information; click here for a route map. Running from Steveston to the Middle Arm of the Fraser River, this walking and cycling trail is a popular sunrise and sunset-watching destination. It also offers some handsome views of the regional mountains to the north as well as the ocean and Southern Gulf Islands to the west. Look out for Sturgeon Banks, an excellent estuary bird-watching location, Terra Nova Rural Park and Terra Nova Natural Area, home to owls and hawks. Running along the Middle Arm of the Fraser River, this scenic trail offers views of Sea Island and the Vancouver International Airport (YVR) as well as the imposing North Shore Mountains. The trail starts at the north end of the West Dyke Trail and runs along the waterfront to Cambie Road (a short walk from the Canada Line&apos;s Aberdeen Station). Look out for Terra Nova Rural Park, Dover Beach, the Richmond Olympic Oval, and Cambie Plaza, with its river pier and striking public artwork. Running north/south from Britannia Shipyards National Historic Site to the Middle Arm Dyke Trail, this route fuses pastoral and neighbourhood pit stops and is popular with both walkers and cyclists. Connecting the Fraser River Middle Arm and South Dyke/Steveston waterfronts, the trail is full of colour in spring and summer, when an abundance of wildflowers grows alongside. Look out for historic Branscombe House, Imperial Landing and, of course, Britannia Shipyards. Start at Garry Point Park and head east. 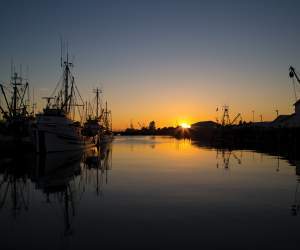 As you leave Steveston’s charming boardwalk waterfront, you’ll enter the South Dyke agricultural area, a rural swathe of produce and berry fields. En route, look out for the Gulf of Georgia Cannery National Historic Site, Imperial Landing, Britannia Shipyards National Historic Site, Gilbert Beach, London Heritage Farm and Finn Slough. Bring your camera, slow down and drink in these evocative points of interest at your leisure. Running alongside the North Arm of the Fraser River, this lively shoreline walk starts where No. 6 Road nears River Road, weaving eastwards along the waterfront to Hamilton Highway Park. It takes in views of the local boating community as well as marinas, float homes, boat-builders and more. Look out for herons and other birdlife on the linked Queen’s Canal Recreational Trail as well as in the Dyke Road and Toyota Park areas. Many of Richmond’s walking trails are also cycling routes. For more information on Richmond’s trails, visit the City of Richmond’s website.